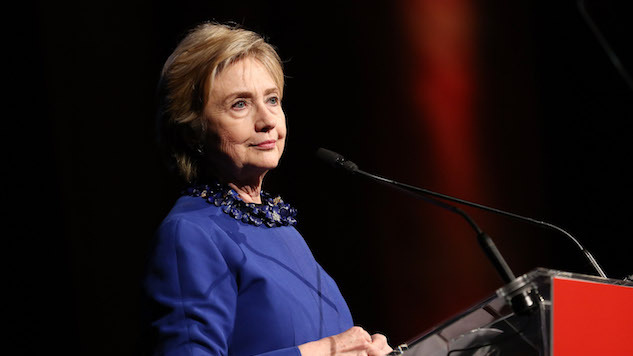 Hillary Clinton Unholsters Her BlameThrower (Again): Russian Election Interference Was "Cyber 9/11"
“I think there a lot more connections that have yet to come to light,” Clinton said Sunday evening in London, according to BuzzFeed News. It’s offensive and stupid for Clinton to compare her election loss to 9/11, but I guess when you spend two decades jockeying for the highest office in the land, only to see it stolen from your grasp by an idiot, you probably start to think of yourself as a fallen juggernaut. And what could possibly take down the perfect candidate, if it wasn’t the computer version of Osama Bin Laden’s agents flying planes into the twin towers? Surely, the only possible reason for her loss rests with Russian trolls, aka the new Al-Qaeda. All we can say now is that we look forward to the electoral version of invading Iraq, aka Hillary Clinton announcing that she’s running for president again.